I'm in London, UK at a conference by the International Network of Narrative Medicine about the power of storytelling for patients and families and the doctors, nurses and therapists who work with them. This morning on the hotel elevator I bumped into two attendees from Brazil. One is a psychiatrist who coordinates a graduate medical school program in Brazil. The other is a theatre actress working with this medical school to develop simulations to promote empathy in professionals. The psychiatrist told me that the medical training there is very technical and they want to infuse it with storytelling that can build understanding. She noted that stigma in Brazil makes people with mental health issues (her field) invisible and I noted how this is a similar issue with disability. Dr. Rita Charon, the founder of the Columbia graduate program in narrative medicine, opened the day by recognizing "the commitment and potential of our work in narrative medicine to change the face of health care" by making care "full, respectful, attentive and hearing." She said that professionals have a kind of wisdom that comes from being so near to illness and death. And she noted that the human body -- with the same organs no matter who you are or where you live -- is a unifying force. 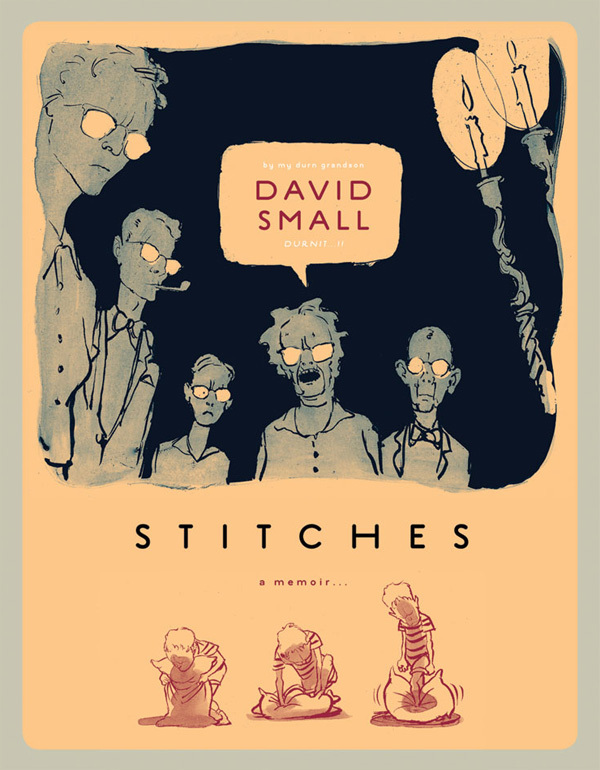 The keynote was given by David Small, author of Stitches, a graphic memoir which was a finalist for the National Book Award. It's the story of his harrowing childhood with a depressed mother who took out her fury on her sons; being diagnosed with thyroid cancer at age 15, which seemed to be a physical manifestation of his mother's silencing of him as a person; and a surgery that left him initially speechless and then regularly without a voice. His saviour came in the form of a psychoanalyst who provided the wisdom and love over years that his mother couldn't. Small talked about how the body often expresses what our minds can not. He wrote and illustrated his book, he says, "because at age 52 I still felt like a troubled boy of 14 or 15, but I didn't want to go there alone. I needed more psychoanalysis" but he lived on a prairie in Michigan far from health care. So he attempted to adopt his analyst's attitude himself, "staying still and listening patiently and empathizing with my story, without getting too involved." This afternoon I attended a workshop about how narrative medicine is being weaved into the medical curriculum in Argentina, the United States, Britain and Israel. One powerful image was a comic strip that was shared with students. It was created by a couple who are both doctors and who had a premature baby with many medical problems. I couldn't understand the Spanish captions, but the pictures conveyed the sense of this couple being rendered powerless by the technology in the neonatal intensive care unit. The Argentinian speaker noted that students are presented with a case of a child with a medical condition and then asked to write stories from the perspective of the patient, parents, siblings and physician. Many of the exercises are aimed at getting students to learn how to see different points of view. A physician from Paris talked about how medical students rated their satisfaction higher when asked to do reflective writing about their clinical experiences than when asked to read scientific articles about narrative medicine. A psychologist from the medical school at Brown University described the goal of narrative medicine for students as "thinking about thinking and developing a reflective professional self." She noted that reflection is "not necessarily intuitive" and needs to be taught. Students write about their experiences and receive feedback from peers and faculty. The goal is to expand their perspective from "doing the work of a physician" to "being a physician" and "attending to the emotional process of becoming a doctor."